Would you like the chance to win a pair of quality 12” powered speakers? 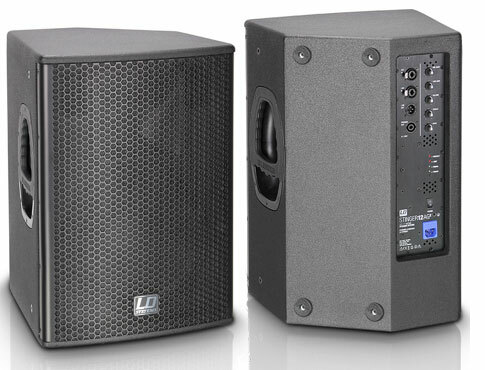 I had the pleasure of road testing a pair of the Stinger 12 A G2 powered speakers from LD Systems. These active cabs retail at around £450 each and we have a pair to give away to one lucky person. They are advertised as affordable quality multifunctional speakers. As for the latter, they are definitely very versatile babies and have a rightful place in both the mobile DJ world and the band circuit. If you like a strong thumpy bass, you will love these speakers. The (black coated) plywood cabinet is probably partly responsible for this wholesome, warm full sound. If I’m perfectly honest, the sound far outweighs the very reasonable price tag. These full range speakers have an inbuilt class D power amp with an output of 400W RMS and 118dB SPL max. Matching subs are also available to complete the set. The 2 band EQ gives further opportunity to adjust the sound to get the best out of them along with additional gain and volume (all adjusted from the rear of the cabinet). They are certainly not short of a meaty thump without the addition of a sub. This makes them ideal for the wide range of music played by a mobile disco as well as live music from a soloist to a 4 or 5 piece band. They also make superb monitors too and are shaped to lie on the floor at the perfect angle. The combination ‘line in’ allows for both connection with an xlr or jack. With the unusual addition of line out via speakon, they can be daisy chained to passive speakers for even greater impact especially when playing in a larger venue. If that isn’t versatile enough, they are also an excellent PA. The mic input means that you don’t have to set up a full rig with mixer as you can just plug them into the power, connect a mic (using XLR or Jack) and away you go. For mobile DJs who do small venue quiz nights, just one of these cabs would be perfect. The 36mm mounting top hat is also adjustable and, when placed on speaker poles, the cab can be angled up or down by 14 degrees. The unique side handles are designed so that you can safely and firmly grab it from different angles. To have a listen to the Stingers and judge for yourself, visit one of the many dealers which can be found here www.ld-systems.com/en/dealer-search/ The exact specs can also be viewed on this site too. Be prepared to be blown away! What (no pun intended) is the RMS output of one of these speakers? The contents of this Infomail are ©AMPdj 2014. It can be reproduced in whole or in part elsewhere provided a clear link to the original (i.e. this page) is included. Monday 9th June 2014, 7.00pm till 10.00pm. Pioneer, Adam Hall, Laser World & Prolight will be there on the night to demonstrate their products plus there will be lots of offers & prizes to give away.Telephone - 01782 814777. If you would like to join our 7,000+ subscribers and be included on our mailing list to receive these free Infomails (or be removed) click the link Subscribe/Unsubscribe above. This is a free to enter competition. No purchase is necessary and all correct entries received before the closing date (Thursday 15th May 2014 at 9pm) will be entered into the prize draw. For full terms and conditions see Competition Terms. Good luck to everyone and our thanks to Adam Hall for their generosity. Free CD for every new member! The team at CD Pool have always looked after our members with some great offers over the years. Now it gets even better with a free 'UK Chart Hits' disc for everyone who joins us. This offer is already proving to be extremely popular with our new AMPdj members. The CD is compiled from the best of the Official UK Top 40 each month. All members of AMPdj are generously rewarded when they refer a new member to AMPdj. It's worth £15 each time, so recommend two people and renew for just £19 - you won't get cheaper than that anywhere else! Looking after our existing members with great offers and benefits ensures we remain the Number One Preferred Organisation for Mobile DJs in the UK. "While you’re sitting there thinking about it someone else is out there doing it."